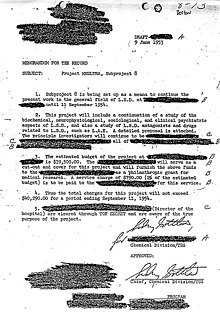 By 1955 Project MKUltra had grown so large that more government funding was needed. At this point subproject 27 (basic research of LSD) was merely a funding subproject that combined all previous subprojects, including those involving LSD, payment to Sandoz Pharmaceuticals, magic and John Mulholland's The Official CIA Manual of Trickery and Deception (subproject 15 magic support, Mulholland Supplement), and the procurement of more LSD (subproject 18), but it continued on to include almost 150 known and documented subprojects, including a microwave gun and the search for alternatives to LSD, which led to later programs like Project MKCHICKWIT, most of which focused on South America. In addition to working with subcontractors like Lockheed, the CIA also worked with other branches of the government, the Advanced Research Projects Agency (ARPA) of the Department of Defense and the Office of Naval Intelligence, though it is unclear what role Gottlieb played in these affairs other than authorizing them. In March 1960, under The Cuban Project, a CIA plan approved by President Eisenhower—and under the direction of CIA Directorate for Plans Richard M. Bissell—Gottlieb proposed spraying Fidel Castro's television studio with LSD and saturating Castro's shoes with thallium to make his beard fall out. Gottlieb also hatched schemes to assassinate Castro, including the use of a poisoned cigar, a poisoned wetsuit, an exploding conch shell, and a poisonous fountain pen. Gottlieb also played a role in the CIA's attempt to assassinate Prime Minister Patrice Lumumba of the Congo; he took a vial of poison to the Congo with plans to place it on Lumumba's toothbrush in the summer of 1960. He transported these "toxic biological materials" to Larry Devlin, the CIA station chief in the Congo, although Devlin declined the assignment and a military coup soon overthrew and killed Lumumba. Gottlieb also wanted Iraqi General Abdul Karim Qassim's handkerchief to be contaminated with botulinum. Gottlieb retired from the CIA in 1972, saying that he did not believe his work had been effective. Visited in retirement by the son of his late colleague Frank Olson, he was residing in an "ecologically correct" home in Culpeper, Virginia, where he raised goats, ate yogurt and advocated peace and environmentalism. He and his wife spent 18 months running a leper hospital in India and he spent his final years looking after the dying at a hospice. On March 7, 1999, Gottlieb died at his home in Washington, Virginia. He was reported to have a history of heart problems, but his wife declined to give the cause of death. ^ Hollington, Kris (2013). "Chapter Four: The Black Sorcerer". Wolves, Jackals, and Foxes: The Assassins Who Changed History. New York: St. Martin's Press. p. 34. ISBN 1429986808. Retrieved September 6, 2015. ^ Hollington, Kris (2013). "Chapter Four: The Black Sorcerer". Wolves, Jackals, and Foxes: The Assassins Who Changed History. New York: St. Martin's Press. ISBN 1429986808. Retrieved July 28, 2016. ^ Coll, Steve. "Remote Control: Our Drone Delusion", The New Yorker, May 6, 2013. Retrieved on May 6, 2013. ^ Weiner, Tim (2007), Legacy of Ashes: The History of the CIA, Doubleday, pg 163. ^ Ignatieff, Michael (April 1, 2001). "What did the C.I.A. do to Eric Olson's father?". The New York Times Magazine. Retrieved January 17, 2013. ^ a b Barnes, Bart (March 11, 1999). "CIA Official Sidney Gottlieb, 80, Dies". The Washington Post. Retrieved August 15, 2015. ^ Weiner, Tim (March 10, 1999). "Sidney Gottlieb, 80, Dies; Took LSD to C.I.A." The New York Times. Retrieved August 15, 2015. Holley, Joe (2005, June 16). "John K. Vance; Uncovered LSD Project at CIA". Washington Post, Page B08. Jacobs, John (1977, September 5). "The Diaries Of a CIA Operative". Washington Post, A1. Kettle, Martin (2000, August 10). "President 'ordered murder' of Congo leader". The Guardian. Marks, John (1991). The Search for the "Manchurian Candidate". W.W. Norton & Company, Inc.
Mazur, Suzan (2005, January 29/30). "Tempelsman's Man Weighs In on the Murder of Patrice Lumumba". CounterPunch. This page was last edited on 16 March 2019, at 03:30 (UTC).